I hope you're having a great summer! Unfortunately, my own summer isn't as relaxing as it could be because we are packing to move! 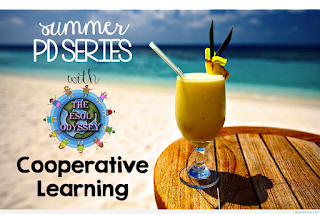 But, I thought I'd take a few moments out to bring you the next installment in the summer PD series! One of the most important ways ELLs acquire language- and content- is through using the language during interactions with peers. Cooperative learning gives students a chance to process thoughts and knowledge, gain insight into the thought processes of peers, and to learn from one another. Most importantly, it gives them a chance to use and rehearse the language we want them to learn and remember. Using small group cooperative learning can also make our ELLs feel more comfortable- talking and working with a small group of people often feels safer than whole-group situations in the classroom. While students do need to be able to work independently using the skills and knowledge they've learned, allowing them to explore that knowledge and practice those skills with their peers prior to independent practice is a valuable part of the learning experience. With proper scaffolding, even students at the beginning levels of proficiency can participate. As an example, when my 4th graders were doing an activity using fraction strips to find equivalent fractions, we talked about, practiced and posted the names of each of the fractions, along with the sentence frames, The fractions _____ and ______ are equivalent and The fractions _____ and _____ are not equivalent. As I circulated and listened, even my level one student fresh from Ecuador was able to participate fully and communicate her understanding. The slideshow below outlines several easy-to-implement cooperative learning strategies that can be used in any content area! There were a couple of these I had not heard of before. I am including a link to this post in an upcoming ELL post of my own. Thank you. Thanks for including me in your post Mary! I hope you find these cooperative learning structures useful in your classroom!